Where do I use my Royal Caribbean voucher code? Discover couples cruise holidays, family cruise holidays, package cruise holidays and cruises in destinations across the globe including Asia, Australia, New Zealand, the Bahamas and Bermuda, the Baltics, the Caribbean, Europe, the Mediterranean, the Middle East, North America, Scandinavia and the South Pacific. You can also discover cruises from the UK, ocean voyages as well as first-time cruises for those of you who are looking to give sailing holidays ago. At Royal Caribbean, you can not only book cruise holidays to an array of stunning destinations you can also book accommodation, activities, holiday extras, holidays for special occasions and shore excursions. 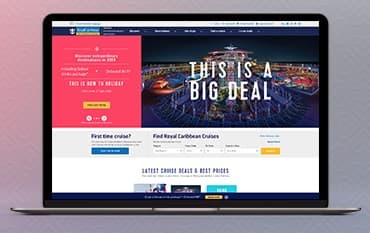 If you’re looking for information on your Royal Caribbean cruise holiday you can check out the discover section where there’s tons of guidance on the entertainment, food and drink, onboard cruise services, technology and wi-fi and ship accessibility available on every Royal Caribbean cruise ship. You can also browse around and find information on each one of the 26 ships available through Royal Caribbean and what you can expect from each one. Use the ‘find a cruise’ tool to find the ideal cruise getaway for you or check out the blog section where there’s tons of helpful information and inspiration on the cruises available. With expert guides, exclusive events and a wealth of brilliant options to choose from, the Royal Caribbean one-of-a-kind shore excursions allow you to experience each incredible destination in a whole new way. Discover adventure tours, beach and water sports, cuisine tours, flightseeing, golf, shows and entertainment, sightseeing, city tours, wilderness and wildlife tours, family friendly tours and accessible shore excursions in locations all over the world with Royal Caribbean. You can also discover European shore excursions, excursions in the Mediterranean, private journeys, multi-day adventures, panoramic Cadiz and Barbadillo wine tasting as well as many shore excursions in stunning locations in locations like Asia, Australia, the Caribbean etc. Royal Caribbean have a fleet of 26 ships including the Adventure of the Seas, the Allure of the Seas, the Anthem of the Seas, the Brilliance of the Seas, the Empress of the Seas, the Enchantment of the Seas, the Explorer of the Seas, the Freedom of the Seas, the Grandeur of the Seas, the Harmony of the Seas, the Independence of the Seas, the Jewel of the Seas, the Liberty of the Seas and the Majesty of the Seas. As well as this there’s also the Mariner of the Seas, the Navigator of the Seas, the Oasis of the Seas, the Ovation of the Seas, the Quantum of the Seas, the Radiance of the Seas, the Rhapsody of the Seas, the Serenade of the Seas, the Spectrum of the Seas, the Symphony of the Seas, this Vision of the Seas and the Voyager of the Seas. This huge fleet of cruise ships boasts an amazing variety of thrilling activities, spectacular entertainment, mouth-watering dining, not to mention award-winning kids’ and teens’ clubs, spacious, comfortable accommodation and sailings that take in some of the most incredible destinations in the world. So whether you’re looking for a fun-packed family adventure, a relaxing couple’s retreat or anything in-between, it’s waiting for you onboard one of Royal Caribbean’s exceptional cruise ships. If you are a UK or Republic of Ireland citizen (including children and infants), you must have your own full 10 year (5 year for children) passport which is recommended to be valid for at least 6 months after your expected return date to the UK, in certain countries this is an entry requirement. It is no longer possible for children to be included on their parent’s passport. Guests holding non-UK or ROI passports should check with relevant embassies. Royal Caribbean International is the pioneers of many firsts at sea, offering a playground of incredible experiences on 26 of the world’s most innovative and spectacular ships, visiting over 250 destinations around the world. Royal Caribbean aims to not only make your time at each destination enjoyable but also the time on board your ship enjoyable too; equipping each vessel with an array of impressive services and features like robotic bartenders, kid’s clubs, huge musical productions, ice skating shows, casinos and much more. Book your cruise holiday with a Royal Caribbean promotion code from us and save money on a cruise of a lifetime. Choose your ideal ship, destinations, accommodation options, on board and on land excursions and other services and enjoy a fantastic sea holiday at a low-cost price. We are constantly on the hunt for Promotion Codes for Royal Caribbean to help you with your money saving. Our experts check dozens of sites for secret codes including NHS discounts, student sites & social media channels saving you time & money!